As small business owners, we advocate for policies that promote responsible economic development, environmental stewardship, and investment in community. We are the backbone of Maine’s economy, and we help provide a political voice for Maine’s small business community. We believe that good economic policy works both for small business owners and the customers they serve. As small business owners, we know our businesses are the foundation of our local economies. We also know the foundation of our success is a healthy customer base. People with good-paying jobs, including public employees and workers in the private sector, are the bedrock of that customer base. For business owners, one of the most significant changes to come out Federal financial reform were new regulations on fees banks and credit card companies can charge on debit card transactions. Swipe fee reform for small businesses was passed last year and is set to go into effect this summer, but Wall Street's army of lobbyists is swarming Capitol Hill trying to delay this common sense legislation for another 2 years. Make no mistake, delaying these reforms is allowing it to die quietly. 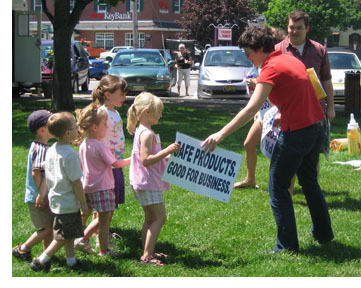 We the undersigned Maine businesses call on this Committee and the Legislature at large to defend the Kid-Safe Products Act. To protect Maine children and Maine businesses, we must make sure that all the products children are exposed to (not just toys) don’t contain chemicals that threaten their health and development. Many of the proposals in LD 1129 would effectively cripple a law that provides critical information and protection to businesses and families. Every Maine consumer deserves a home that is free of toxic chemicals, just as every Maine business deserves the right to know that the products being sold on their shelves are safe. Thursday, April 7th was the Maine Small Business Coalition's Statehouse Lobby Day. Small business owners from all over the state lobbied members of the legislature on issues like protecting access to affordable health insurance, stopping the repeal of the Informed Growth act, which allows towns to evaluate big box development, and stopping environmental rollbacks that will damage Maine's quality of place and hurt Maine's brand as a state.